Active Hands have launched a brand new gripping aid: the Small Item gripping aid. 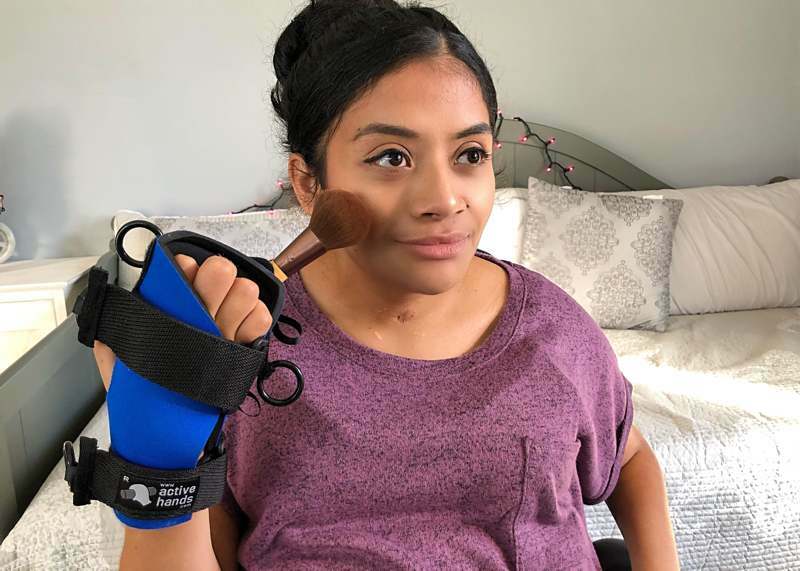 This new device helps people with limited hand movement grip items such as toothbrushes, pens, art equipment and make-up brushes, giving users the independence to tackle everyday tasks more easily.. The Small Item gripping aid comes in two parts: a neoprene glove and a Velcro-backed palm pad with clamp. This unique design means that items clamped in the palm pad can be placed into the glove at any angle, making a wide range of activities accessible. Those with reduced hand function are able to hold pens upright, a toothbrush sideways or a mascara wand at just the right tilt. It has been used with great success during art classes where participants were able to paint on an easel or use a drawing board with comfort and confidence. As with all Active Hands products, it is designed to be used with little or no finger strength. The clamp mechanism can be easily opened and closed to switch between items. Alternatively, additional palm pads can be purchased, enabling users to pre-load commonly used items and simply switch between the palm pads without having to remove the glove each time. In this way, the aids can promote greater autonomy in many aspects of daily living. Pens and pencils can be left clamped in a palm pad on a desk or in a pencil case, ready for work or school. For artistic activities, several paintbrushes can be clamped in separate palm pads to switch between colours more easily. 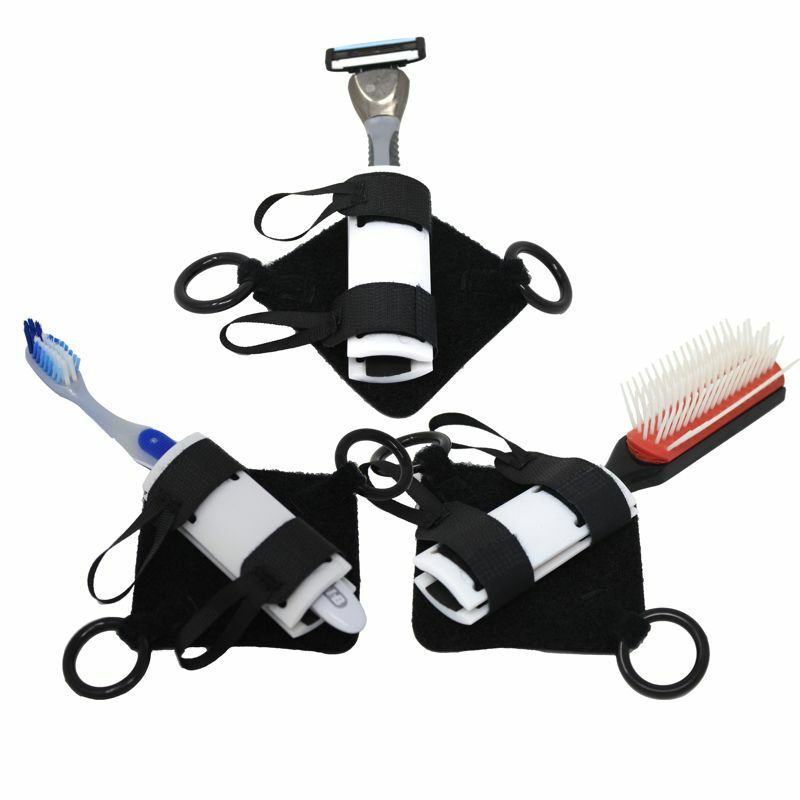 At home, the Small Item Aid is ideal for items such as make-up brushes, toothbrushes, razors etc, enabling users to have far more independence over their own personal care. Director of Active Hands, Rob Smith explains, “our mission is to help people achieve more active and inclusive lives – giving them independent access to a variety of activities that would be impossible without Active Hands gripping aids. We offer a wide range of solutions for the frustrations of daily living as well as fantastic solutions to getting active. The Small Item gripping aid has been developed out of many years of feedback from customers who have enjoyed our wide range of gripping items and were looking for something to support them in fine-motor activities. In our preliminary testing we have received very positive feedback and we are excited to launch this Small Item gripping aid at the OT Show, Birmingham in November. The gripping aid will retail for £49.95 and is available in both small and standard/large sizes. Packs of 2 additional palm pads will retail for £24.95. For more information about our new gripping aid, or any of the products in our range, visit our website at www.activehands.com or email info@activehands.com.